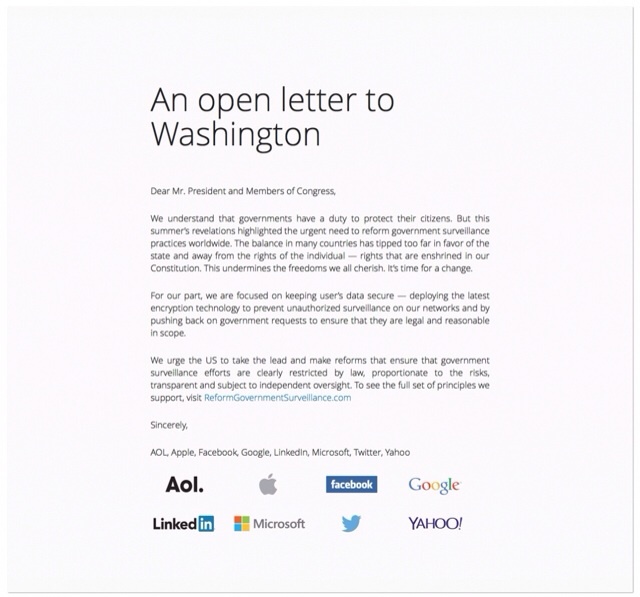 Apple, AOL, Facebook, Google, LinkedIn, Microsoft, Twitter, and Yahoo have sent an open letter to Washington urging reforms that ensure that government surveillance efforts are clearly restricted by law, proportionate to the risks, transparent and subject to independent oversight. The open letter was posted to http://reformgovernmentsurveillance.com/. Notably, the site also features a statement on Global Government Surveillance Reform and principles for reform that Apple apparently did not add its name to. - Aol, Facebook, Google, LinkedIn, Microsoft, Twitter, Yahoo! Transparency is essential to a debate over governments’ surveillance powers and the scope of programs that are administered under those powers. Governments should allow companies to publish the number and nature of government demands for user information. In addition, governments should also promptly disclose this data publicly.